We are located directly across from USAA on Fredericksburg Rd. outside loop 410. From I-10, take the Huebner Road Exit. When driving west (direction: Boerne), turn left onto Huebner Road, drive under the highway and one additional block, then turn left again onto Fredericksburg Road. When driving east (direction: Houston), take a right onto Huebner Road, drive one block, and turn left onto Fredericksburg Road. 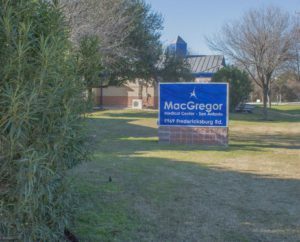 Continue south on Fredericksburg Road and after the second traffic light (USAA Boulevard) turn right into the MacGregor parking lot. Complimentary parking is provided for you right next to our office.